A cotter pin, as a split pin or cotter key is a metal fastener with two tines that are bent during installation, similar to a staple or rivet. Typically made of thick wire with a half-circular cross section, split pins come in multiple sizes and types. There are signs that manufacturers and stockiest are increasingly listing both names cotter pin and split pin together to avoid confusion; this led to the term split cotter sometimes being used for a split pin. We manufacture cotter-pins in 5/64â€� to 5/8" & 2 to 16mm diameter. 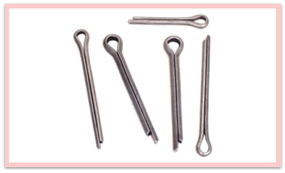 We also manufacture cotter-pins in BRASS, COPPER, BRONZE, AND STAINLESS STEEL materials as well as per standards DIN 94, ISO 1234 , BS 1574, etc. Application: Split pins are frequently used to secure other fasteners, e.g. clevis pins. A common application of this is when used to secure a castellated nut. DIN: - 94 cotter pins, or split pins, are bent to insert into the holes ofÂ clevis pinsÂ and other fasteners to secure the fastener system.